Clean Text is an essential tool for webmasters, graphic designers, developers and magazine editors to reduce text cleanup and editing time, and it is a very convenient tool for all Mac users that needs to cleanup and editing text from emails, documents, or other material. Clean Text quickly performs many essential text processing functions such as removing empty lines, removing unwanted spaces, converting tab characters, smart quotes, and more. In addition to this, smart tools let you solve with a single click, the most common cleaning problems of text found in email messages, documents and web pages. 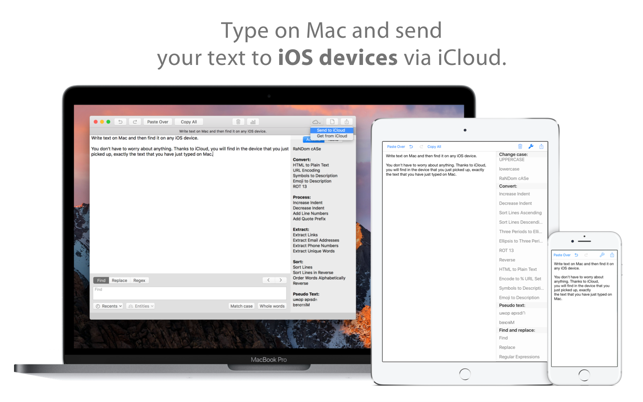 With Clean Text, you can write text on Mac and then find it on any iOS device. Thanks to iCloud, you will find in the device that you just picked up, exactly the text that you have just typed on Mac. Just use the iCloud menu to send or receive the text via iCloud. Clean Text for iOS requires a separate purchase. While you type in the search box all occurrences within the text will be highlighted to give you a complete picture, then with the Select Next and Select Previous buttons you can gradually select instances to edit or change them. Also Ignore Case, Contains, Starts With and Full Word, act immediately on the highlighted text and will allow you to do the replacements with millimeter accuracy. 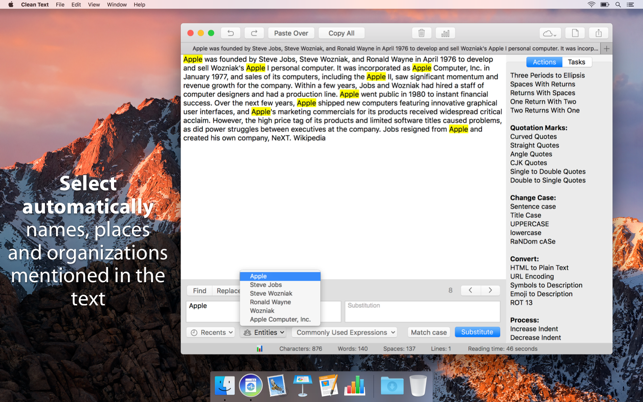 Clean Text takes advantage of Apple's Core ML, a new foundational machine learning framework to deeply understand text. The new Entities functionality of the app uses machine learning and natural language processing (NLP) to instantly identify and select personal names, place names and organization names mentioned in the text. Easily create automated tasks that perform a series of processing actions and replacements in the text. Creating tasks is within everyone's reach, and if you're an advanced user, you can also include Regular Expressions patterns in your tasks. 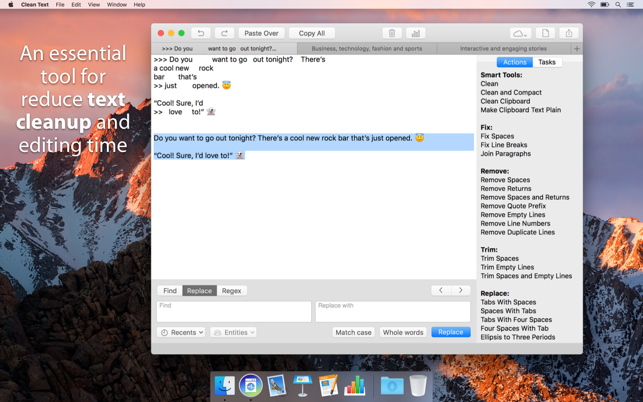 Clean Text supports the latest macOS technologies, such as: iCloud to access the same text from any Mac and iOS device; Touch Bar for quickly enter Emoji; Sharing with Mail, Messages, Note, Reminder, Twitter, Facebook, Linkedin; document advanced tabbed browsing and infinite undoes and redoes functionality. The app is written in Swift, the new fast and powerful Apple's coding language. • Fix spaces and line breaks, join paragraphs. • Replace tabs with spaces, spaces with tabs, spaces with returns and returns with spaces. • Convert quotation marks: curved, straight, angle, German and Chinese quotes. • Convert from single to double and from double to single quotes. • Remove empty lines, spaces, returns, duplicate words and duplicate lines. • Convert HTML to plain text and URL encoding. • Convert emoji and symbols to their description. • Increase and decrease text indent. • Add and remove line numbers and quote Prefix. • Sort lines and order words. • Extract Links, Email Addresses, Phone numbers and Unique Words. • Find and Replace with live highlighting of matches. • Regular Expression search and substitution. • Automatically select personal, place and organization names. • New "Copy Highlighted" menu item. A functionality that allows you to copy to the clipboard all the text highlighted by a search (useful in RegEx searches). 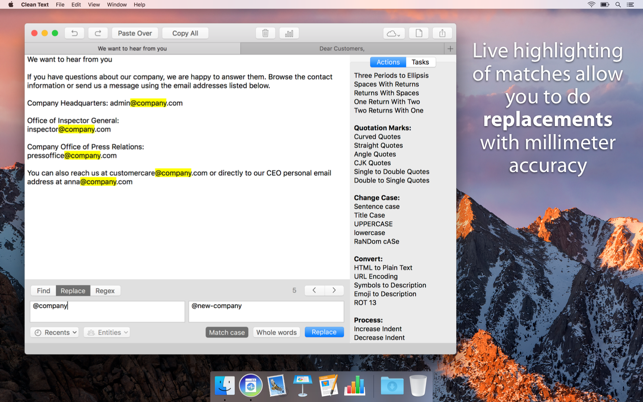 • Now the "Copy All", "Paste Over" and "Clear All" features have their corresponding menu items in the menu bar. Clean Text has its uses, but it’s not configurable enough. For example, you can’t select which “Actions” you want displayed, or rearrange them. ROT13? RaNDom CASe? The “Pseudo Text” actions? Useless, I don’t even want to see those. Another example, “Add Quote Prefix” inserts a “>”. What if I want to prefix my lines with a different character or characters, like “pipe space” (“| “)? There’s no way to tweak the “settings” of an Action, even inside a task. The title of my review pretty much says it all. It’s also odd to me that if I choose “Hide Clean Text” I have to go click something in the Dock to show it again. Seems like the menu item should toggle to “Show Clean Text”? It would also be nice if you could assign global hot keys to tasks, so if I copy something to hte keyboard, I could hit a key combo and activate a task that loaded the clipboard, did some “cleaning” and then moved it back to the clipboard so I could just Command-C to copy, Command-Control-C (or whatever global hot key you assigned to the ask) to clean, and then Command-V to paste in whatever app I happen to be in. Thanks for reporting on the item menu to hide the app on the menu bar, we have corrected it for the new version. We are also working to include the possibility of disabling unused actions. As new versions come out we plan to add new features and customization possibilities. I have been using this application for over 6 years, and I have to say. I love it. Clean Text has been a staple for me and my workflow for many years, and will continue to be for years to come. I am So glad it was finally rewritten, and Iove exploring all it has to offer. 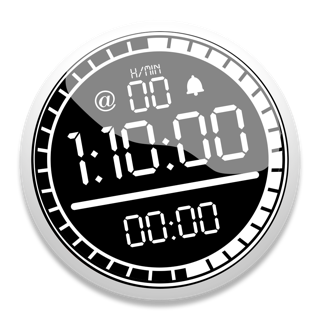 While this app was in need of some help, the functionality was totally acceptable for years and now it has the polish to make it even more easy and satisfying to use. Thank you Apimac for making this program and giving it an (albeit much needed) update! You make the life of web developes easier, FOR SURE! Thanks for the review, we will work constantly to ensure that you will always be satisfied. I seldom write reviews, but I hadn’t used this app in a few months, and just discovered the beautiful new interface. I’ve used Clean Text for a number of years, and it’s great for doing what it says: cleaning text. I use it all the time when moving text from one app to another (especially if I’m coding for the web). There are several new actions in 7.0 that I know I’m going to love. Thanks to the author for such a pleasant upgrade!